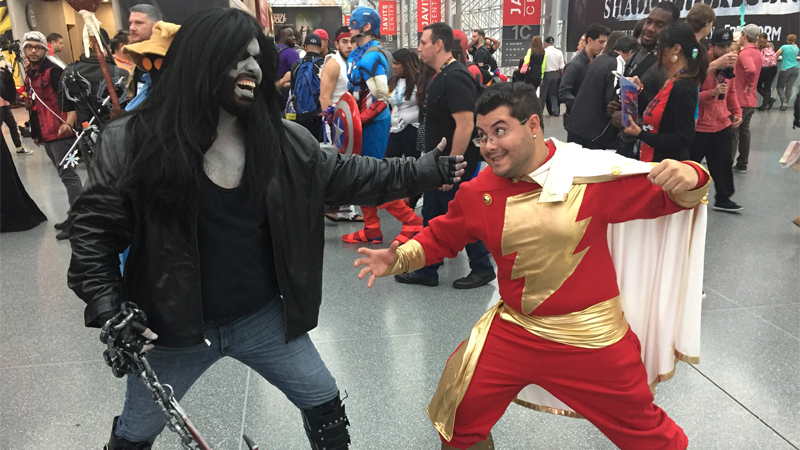 Lobo and Shazam duke it out! All images by Evan Narcisse unless otherwise stated. Overwatch’s Genji is with you—Ikuzo! A fearsome orc readies for battle. Rogue and Gambit, ma cherie! Halo’s Master Chief takes a call from Cortana. Heroes never die while Overwatch’s Mercy stands ready. Elektra and Nightwing pose with the boy wonder. Laura Kinney, aka X-23, aka All-New Wolverine, and Nico Minoru. Overwatch’s Lucio is ready to drop the beat! The Joker has you in his sights! Marko and Alana from Saga. The Phantasm from Batman: Mask of the Phantasm. Steven and garnet from Steven Universe. The creature from the Black Lagoon claims another victim. Doctor Strange is ready to put a spell on you. Family cosplay is the best cosplay. You really do have to appreciate a chestbuster that knows how to tapdance. The Invincible Ironheart herself, Riri Williams. Do you recognize any of the characters we missed? Let us know in the comments—and share your favorites!